If nothing else, Aaron Boone has shown he is relentlessly positive in his few short months as a big league manager. He enjoys wins and seems to quickly turn the page on losses, which are good managerial traits. The Yankees seem loose, they look like they’re having fun, and they’re winning lots of baseball games. The first few months of the Aaron Boone era have gone very well. Boone has also shown that he has his players’ backs at all times, even when everyone else is throwing a dude under the bus. There is no better example of this than Dellin Betances. 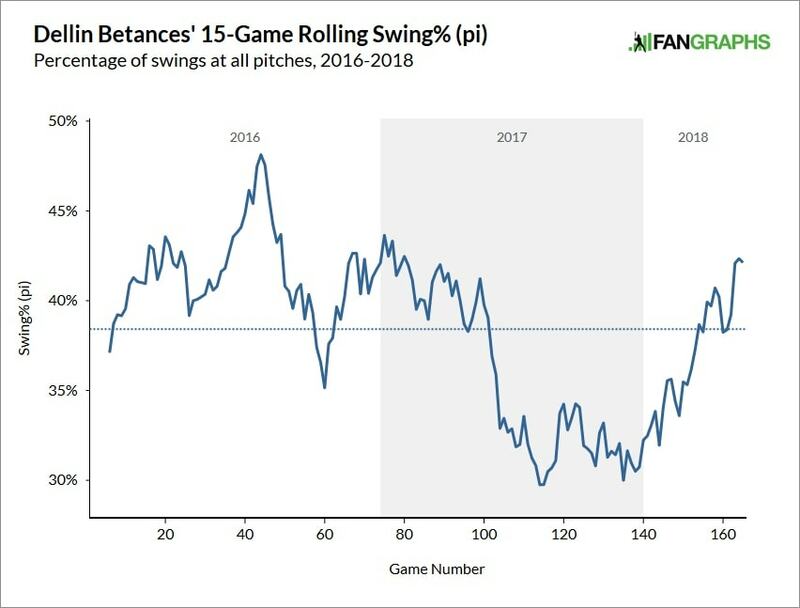 Betances completely lost the strike zone late last year and was unusable in the postseason. Then Dellin gave up a home run in his first appearance this season, and the second time out Kevin Pillar stole his way around the bases. It was ugly. Many fans were ready to run Betances out of town. Saw it with my own eyes on social media and our comments. Boone? Boone stuck with Dellin the entire time. “We’ll continue to work with him, continue to believe in him, and continue to need him in big situations,” said Boone after the ugliness of the opening series in Toronto. It was easy to laugh at that given what was happening on the field, but Boone meant it. Fast-forward to June, and now Betances has reestablished himself as the Eighth Inning Guy™ and is once again a dominant setup man. 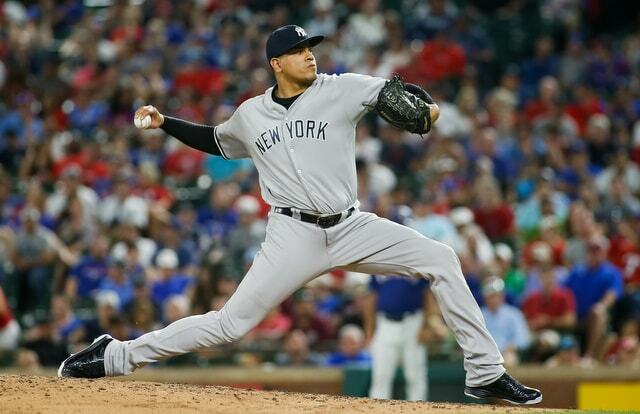 The 3.54 ERA leaves something to be desired, but, in 24 games since that opening series in Toronto, Betances has a 2.88 ERA (1.87 FIP) with 44.6% strikeouts, 9.9% walks, and 51.1% ground balls. He struck out the side on eleven pitches Saturday and you can see his confidence is back. The swagger is back. Betances credited bullpen coach Mike Harkey for helping spur on the turnaround — “Harkey is a guy who I rely on and I try to repeat everything that he tells me to do when I’m out there. I think I’ve been listening a little more,” he said — and chalked it up to improved fastball command, fewer breaking balls, and a better game plan. Two things stand out to me so far this season. One, Betances is throwing more strikes. I mean, duh. He’s thrown 51.1% of his pitches in the zone this year, up from 46.7% last year and 45.0% the year before. The MLB average is 48.0%. And two, more pitches in the zone means hitters have to actually swing against Betances. Last year he was so wild they stopped swinging and let Dellin work himself into trouble. That is no longer the case. It sounds obvious — and it is — but gosh, throwing strikes makes a world of difference, especially for a dude like Betances. His stuff is so good that the hitter is on the defensive even in non-two-strike counts. How many times have we seen hitters buckle at the curveball and swing late on the fastball? When he’s right, Dellin can make hitters do funny looking things at the plate, and we’ve seen hitters do more funny looking things lately. With Betances, it always feels like we’re waiting for the other shoe to drop, especially these last two years. We’ve seen him do the “great early in the season and bad late in the season” thing multiples times now, and it is entirely possible he’ll do it again. There’s not much else we can do other than wait and see how the season plays out. I know two things though. One, Betances has been awesome lately and he’s helping the Yankees win games. Good Betances is really good. 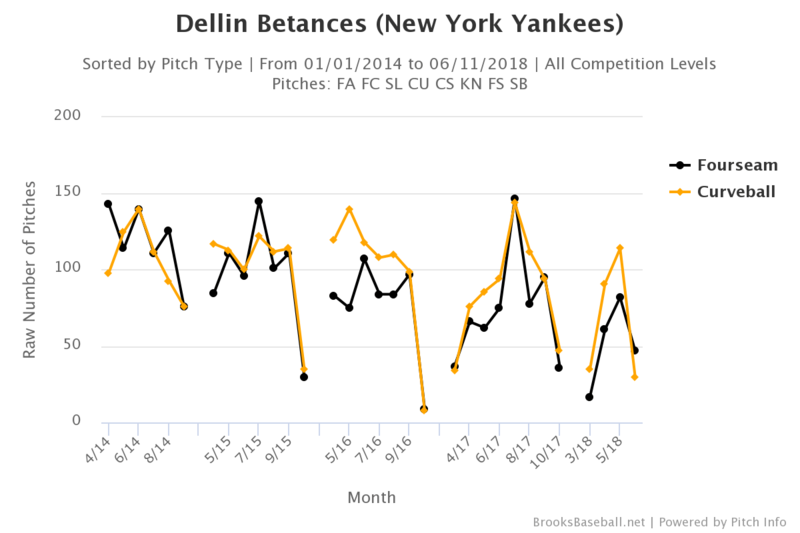 And two, if Dellin were as much of a headcase and as mentally weak as so many people seem to think, he wouldn’t have rebounded from last year to be this good again. The headcase and mentally weak stuff is straight garbage. Lazy trope by those unwilling to look for a real answer. Betances has a history of mechanical issues and control problems who had mechanical issues and control problems last year. And so far this year, he’s fixed whatever ailed him, thanks in part to the team’s patience.